Hello everyone, I don’t know about you, but sometimes I just don’t know what to read next. Most of the time I pick my next read based off of what catches my eye, but sometimes that does not work. So I decided to make a TBR jar. Now of course I went to youtube to get some inspiration. I ended up getting inspiration from J. Bookish , although I did tweak it a bit because I did not want to wait overnight for it to dry. Now on to the DIY project! 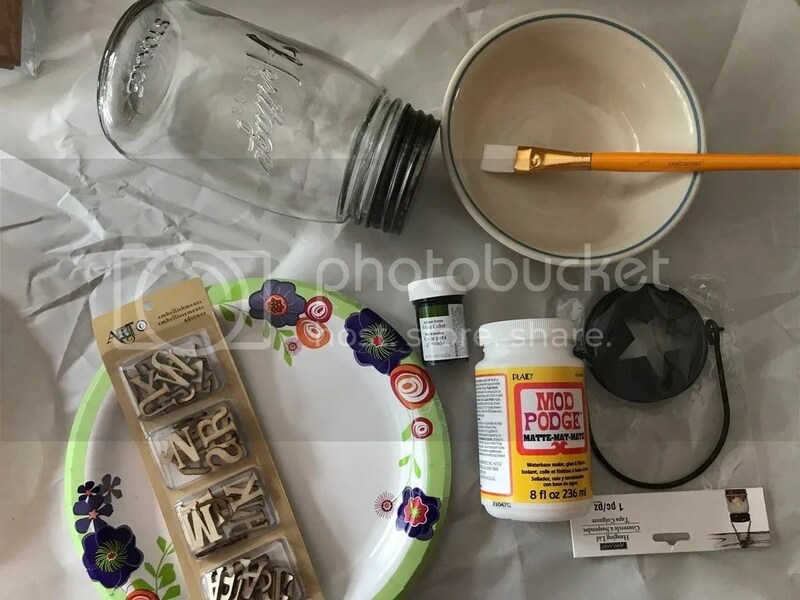 You need a jar, Mod Podge, gel food coloring, a few paper plates, a paint brush, and any decorations you may want. I picked up wooden letters and a few small paper flowers. Depending on the decorations you get you may need a hot glue gun or super glue. 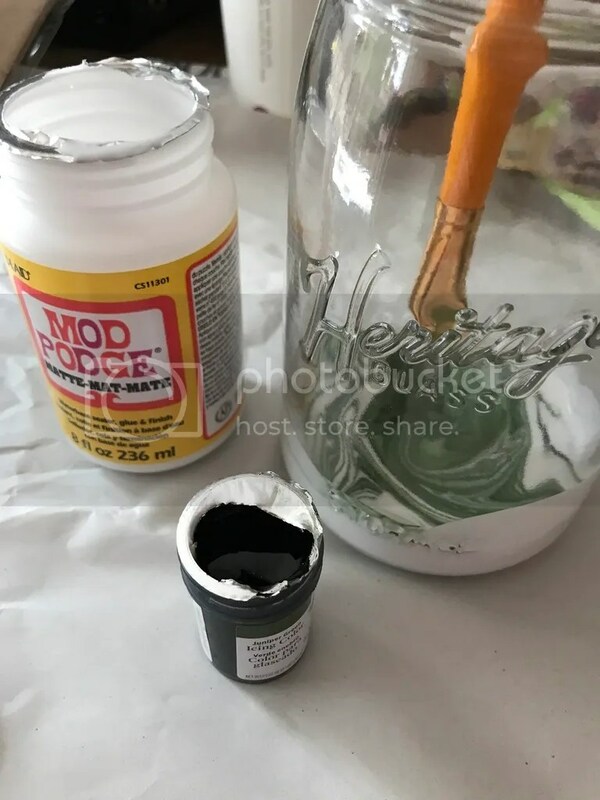 For this step you are going to take your jar and add some Mod Podge, I recommend adding more than you think you will need. Then add a little bit of the gel food coloring. For the coloring I suggest starting off with a little and mixing it, then you can add more if you would like the color to be darker. Stir, stir, stir until everything is evenly mixed. This is important because it will show later on if it is not mixed correctly. P.S. don’t stir to quickly you will get air bubbles. 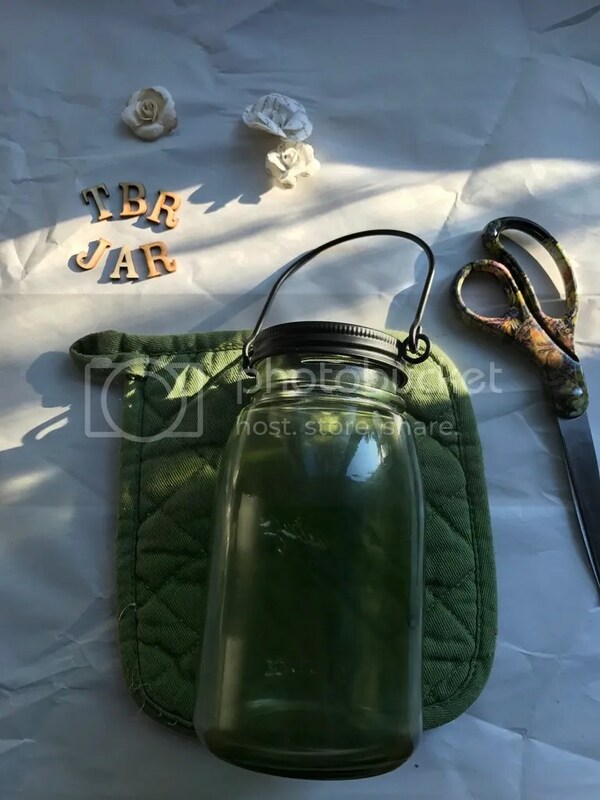 Step 3: Turn That Jar! Now that your color is mixed you need to slowly rotate while slowly turning it side ways. This will evenly distruble the mixture inside the jar. If done to quickly you may have uneven coverage and air bubble. 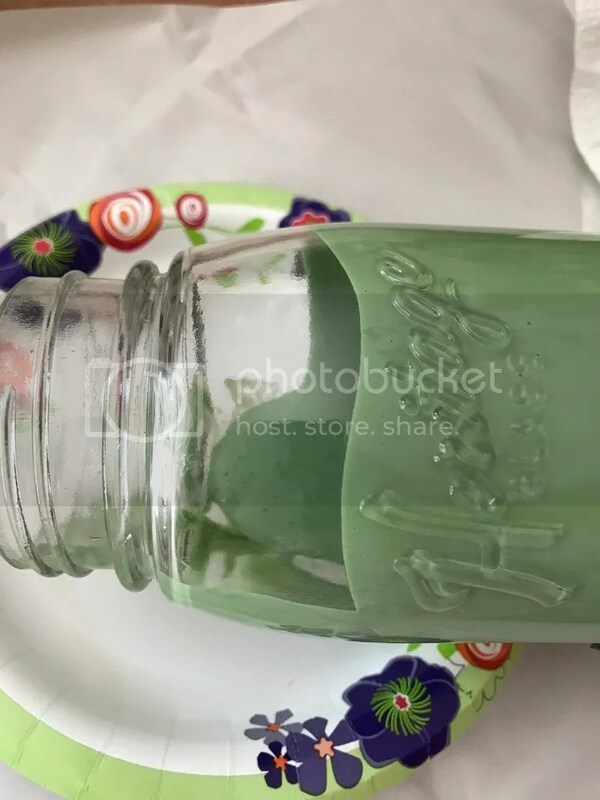 Once your entire jar is covered continue to rotate it and pour the extra color mixture onto a plate. Get as much of this out as you can because it will speed up your drying time. Set oven to warm or 175 degrees F. Place the jar upside down for 10 min. on top of wax paper or foil. When those 10 min. are up it is now time to flip your jar over so the opening is facing up and keep in oven for another 20-30 min. If you take it out of the oven and there is still streaking you may need to leave it in for a bit longer. While it is air drying or you are baking it in the oven now is a great time to either print and cut out the books on your TBR or hand write them. Even though I did not add reading challenges I think that could also be a fun idea. Step 5: The Fun Part, It’s Time to Decorate! Here are a few of the decorations I picked up, you can get whatever it is you like. I did not end up using everything. Sorry you cannot really see the color of my jar in this picture. I had to place it on an oven mitt to protect my floor. Yes, I was to lazy to wait over night, I wanted to decorate! 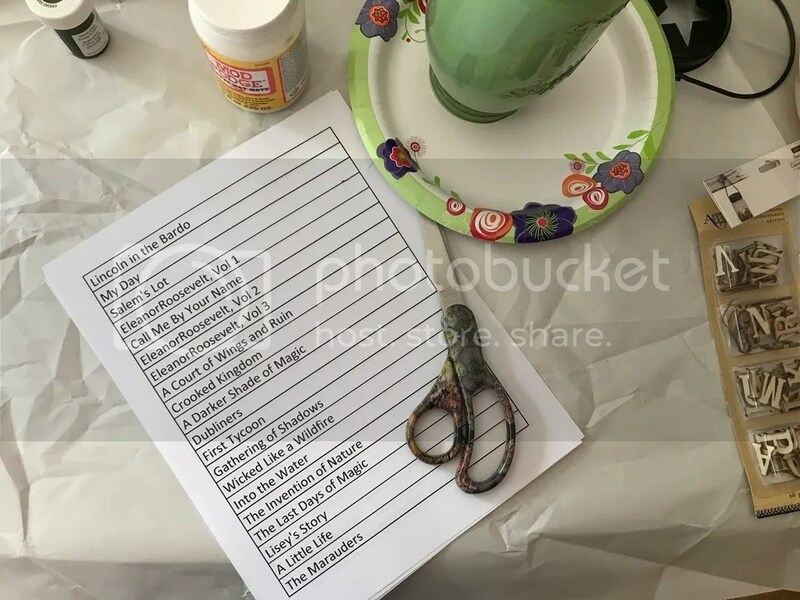 Anyway, I suggest planning out what you are going to place on your jar. As you can see in the top left I picked out my letters and flowers and laid them out. 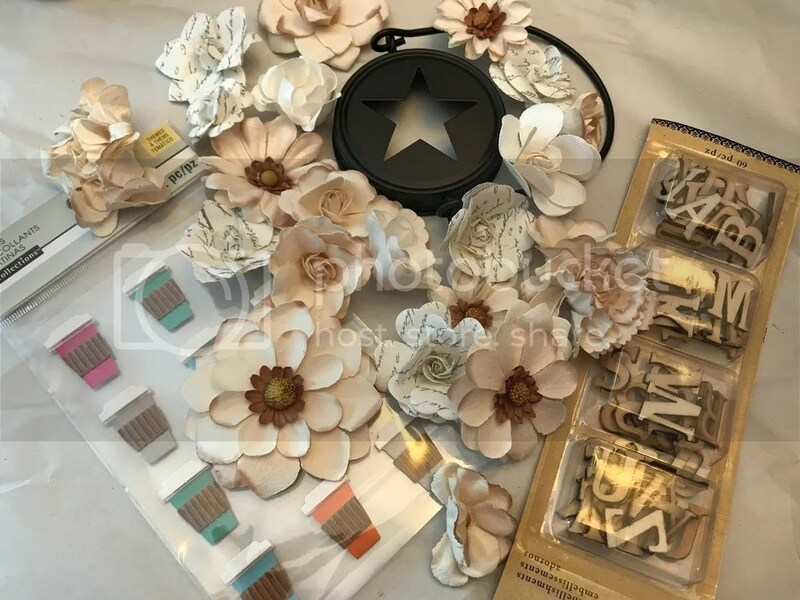 Now depending on what decorations you get you may need a hot glue gun, use some more of the glue we used earlier, or you have picked something that already has adhesive on it. Here is my final TBR jar. I really love how the color came out. It is light enough you can see all the papers inside, but dark enough that it colorful. I hope you enjoyed this little bookish DIY. I love this DIY because it is so customizable and does not require a lot of supplies. It can be as simple or complicated as you want to make it. 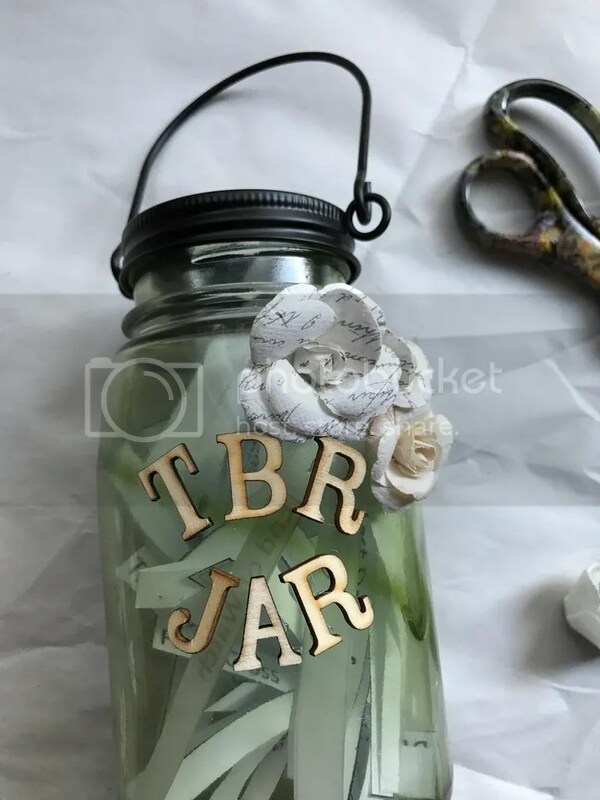 Do you have a TBR jar? Thank you, I bet yours will come out great! This is SUCH a cute idea, and the finished product looks great! I’d never thought of using a TBR jar before, but I really like it. Aw, thanks that is so sweet of you! I never used one before, but I actually enjoy it more. It makes each read more of a surprise. 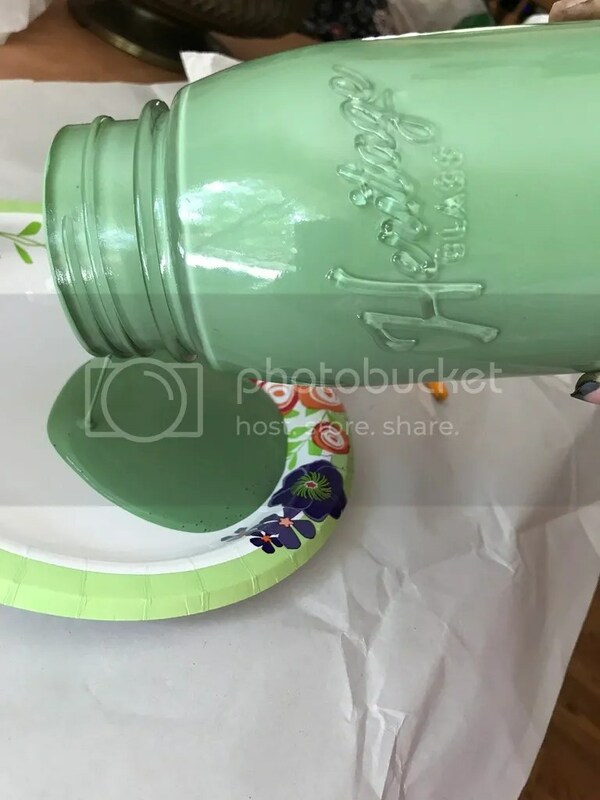 Such a cute jar! I love it! That looks so awesome!! Love the idea! After this I quit PhotoBucket and joined SmugMug. Prices are way cheaper. I started using another site, but I have not moved the pictures over yet. Thanks!